You may have seen Rock Creek Sports Club member David Wood around the gym. He, like many other members here, comes in as often as possible to build strength and endurance to keep up with a favorite hobby — in David’s case, Alpine Climbing. What you may not know about David though, was his recent impact on journalism history. This past April, David was awarded the Pulitzer Prize in National Reporting for his series “Beyond the Battlefield” for the Huffington Post. This was a first for both David, and for the seven-year old web-based newspaper. Beyond the Battlefield, a 10-part series which ran for several months on The Huffington Post, explored the challenges that severely wounded veterans of Iraq and Afghanistan face after they return home, as well as what those struggles mean for those close to them. 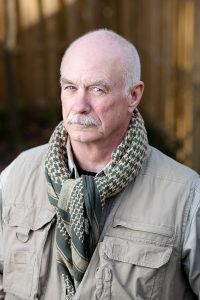 After more than 30 years of covering war and conflicts all over the world, David said he has witnessed numerous injuries and always wondered what happened to them after they were taken away on helicopters or driven off to hospitals. Currently, David is working on a new “disconnected series” interviewing warriors returning come from combat — some wounded, other not — as they deal with issues such as anxiety, memory loss, and the job hunt in a civilian world. You can read his articles in The Huffington Post here.